When you travel are you? Tired of not knowing which adapter a country takes? Still carrying around 4 adapters and one USB charger for every device in your bag? secure power in over 150 countries simultaneously charging up to 5 devices. spike and overcharge protection safeguards your valuable devices. it is great for powering smart phones, tablets, mp3 players, gaming systems, eReaders and notebooks. 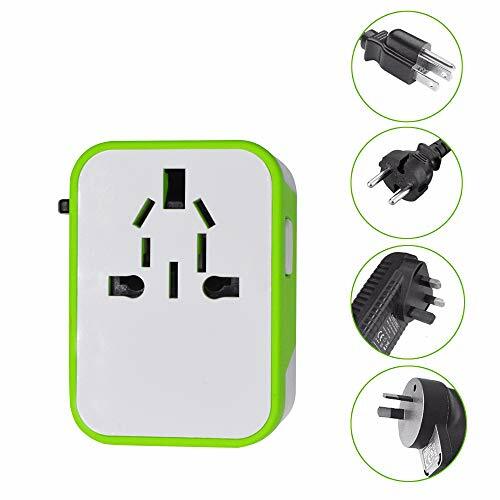 The all-in-one Integrated USA, EUROPE, AUSRALIA and UNITED KINGDOM plugs eliminates the need for multiple travel adapters. The days of the bulky heavy electric converters are over! Slide out world travel plugs for US, EU, UK and AU with an 8 hole input socket compatible with every international standard 2 and 3 prong plug. The perfect worldwide traveling companion for men or women. Almost complete global coverage. At home in cities like London, Paris, Singapore or Dubai as well as the European, African, American or Asia back roads. Fresh green rubberized oil surface and safety shutter prevents external shock and short circuit. Single piece construction in a compact size and convenient carrying case make it a necessity for foreign or domestic travel. The soft amber lighted USB ports provides a night light. Why purchase even a single multi set individual type adaptors combo kit when you can make your travel bag lighter and less cluttered with just one portable Universal Travel Adapter for your overseas trip? FCC CE RoHS SGS certified and backed with an 18-month guarantee. If you have any questions about this product by UZQS uccess, contact us by completing and submitting the form below. If you are looking for a specif part number, please include it with your message.